One of the best things about Christmas is the carol singing. It get’s you into the spirit of Christmas and those singing are raising money for good causes, a reminder of the true spirit of Christmas. Well done Tessa Henderson (not in the picture as she was taking it) and her friends. Merry Christmas. 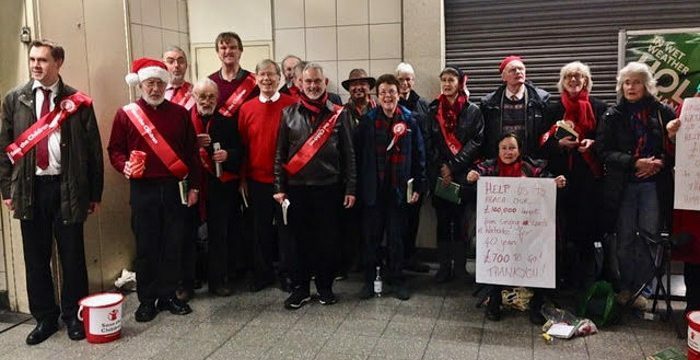 Every Christmas since 1977, West Hampstead resident Tessa Henderson has been organising her friends to go carol singing. They have had a pitch at Waterloo Underground ticket concourse for two evenings in the run-up to Christmas. I write ‘they’ because she couldn’t have done it without the support of friends and family, but she is very much the driving force behind it. Tessa says “It’s all down to the tireless energy of the singers and collectors who come year after year. I just do a bit of organising. It’s an amazing feeling to raise that kind of money just from opening your mouth”. These aren’t just any carol singers. Tessa has been singing all her life and has recruited friends from renowned amateur and professional choirs, including over the years, a few who were members of the ROH and ENO chorus. 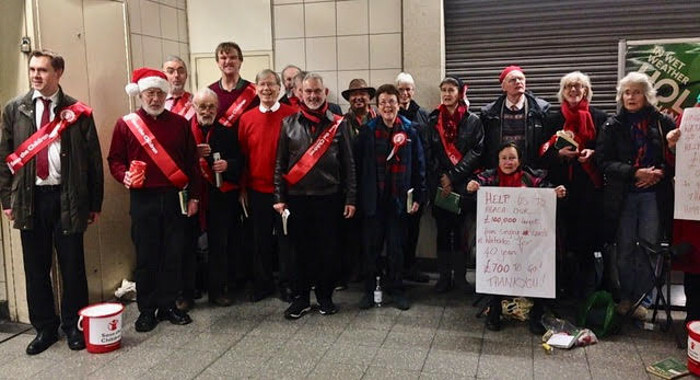 It is hard work singing for more than two hours non-stop, in a chilly underground station, but it is also great fun and rewarding to be part of such an incredible fundraising effort. In the first year, they raised £268.30 setting off on a journey, which, 40 years later, would see her reach the grand total of £100,160. To help reach that, in lieu of presents for her recent birthday she asked for donations to Save the Children, and this year she has set up a 40th anniversary Just Giving page. The carol that gets the best response? Ding Dong Merrily on High! (Click on the link to hear them in action).